The No. 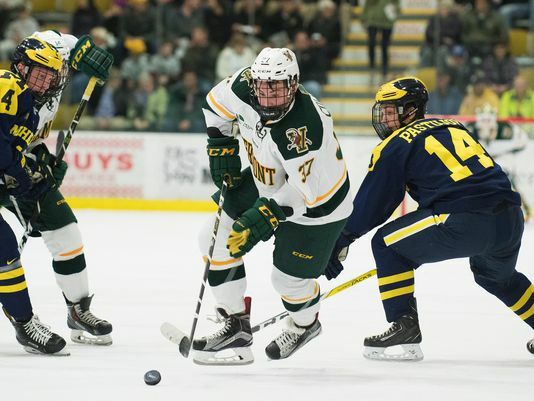 3/4 Quinnipiac Bobcats were out muscled, out hustled and clearly didn't play anywhere close to the their national ranking in a 5-1 loss to Vermont in the Belpot final of the Friendship Four tournament in Belfast, Northern Ireland. The Catamounts brought their skating legs all night and had the Bobcats defense on their heals all night long. It was a display of hockey that Quinnipiac fans are not accustomed to seeing with this team and it showed they have a lot of work to do if they want to challenge for a national championship come April. In the first period Ross Colton got the scoring started less than six minutes into the game, when he picked off a pass in the neutral zone and skated into the crease beating goaltender Andrew Shortridge for the goal. Vermont made it 2-0 seven minutes later when Mario Puskarich bombed a one timer in the slot on a pass from Craig Puffer. The Bobcats lost senior captain Connor Clifton to a five minute major penalty for a hit to the head 13 minutes into the first period leaving Quinnipiac shorthanded on defense for the rest of the game. The team was already without fellow captain Derek Smith on the blue line for an undisclosed reason. In the second period the Bobcats played a better period but still came up empty on the scoreboard. They peppered 14 shots in the period on Stefanos Lekkas who played exceptionally well for someone who does not have ideal size for a goaltender. He used his quickness and athleticism to stuff the Bobcats time and time again. Quinnipiac had four power play opportunities in the second and could not cash in. Late in the period the Catamounts made the score 3-0 on the power play when Jarrid Privitera tipped a shot from the point by Rob Hamilton that went through several players and past Shortridge. The Bobcats got on the board 7:58 into the third period on the power play when Brogan Rafferty sent a pass to the opposite circle to Craig Martin who blasted a shot past Lekkas to make it a 3-1 lead for Vermont. Chase Priskie also picked up a secondary assist on the goal. Not even a minute later the Catamounts responded on an unassisted goal by Ross Colton (his second of the game). A little more than two minutes later the Catamounts put the cherry on top with a goal by Derek Lodermeier. You have to give credit to Vermont as they played extremely well defensively against Quinnipiac keeping many shots from the the outside and not giving the Bobcats many good looks or time and space to work with. The Catamount defense also blocked 18 shots on the game and were willing to do anything to prevent the Bobcats from having easy scoring opportunities. Lekkas finished the game with 40 saves while Andrew Shortridge made 17 for the Bobcats. I think that Quinnipiac didn't look as comfortable on the bigger sheet of ice this weekend as they do on normal size rinks. It was a missed opportunity for the Bobcats against a team in the top 15 of the pairwise to pick up another quality win. Quinnipiac will now head home for a weekend slate of games against RPI on Friday and Union on Saturday.